Lucia S. Olarte, MD offers Botox to clients in Century City and Beverly Hills, Los Angeles, California, and the surrounding area. Botox is ideal for patients who want to lessen the appearance of wrinkles and folds in the skin on the face. Patients who are interested in scheduling Botox treatment should contact the office for more information. Botox®, Xeomin® and Dysport® are FDA-approved treatments for wrinkles and fine lines. They are highly-purified muscle-relaxing agent that relaxes selected facial muscles known to cause certain wrinkles. Dr. Olarte injects a small amount of Botox into the muscles near your wrinkles using a thin needle. The substance forces the muscles to relax, which reduces the appearance of the wrinkles. What wrinkles will respond to Botox? Botox is most appropriate for the crow's feet near the eyes, lines on the forehead, and frown lines that appear between the eyes. However, Dr. Olarte may recommend Botox for wrinkles in other locations as well. Dr. Olarte also uses Botox to elevate the brow and rejuvenate the upper part of the face. Botox is a quick procedure with very little downtime. Most patients are able to return to their normal activities almost immediately after the procedure is complete. Treatment with Botox poses only minimal risk to you. However, some of the possible complications of Botox include headache, pain, swelling, bruising, crooked smile, and drooping eyelids. Some patients may also experience eye dryness or tearing. Dr. Olarte personally performs all of the Botox procedures she recommends, so patients can be sure they’re in good hands. 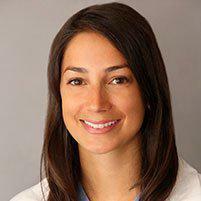 Given Dr. Olarte’s expertise in facial anatomy, the risk of complications is low. Some patients may notice the results of Botox shortly after the procedure. However, it can take up 2 weeks for the results to appear fully. The needle Dr. Olarte uses to perform Botox injections is incredibly thin. Some patients report feeling a small pinch during Botox treatment, while others report feeling almost nothing. The effects of Botox last approximately 3-5 months, depending on the patient. After the effects disappear, many patients choose to repeat treatment with Botox. Other muscle-relaxing agents Dr. Olarte may recommend include Dysport® and Xeomin®. Dr. Olarte also offers injectable fillers, including Radiesse, Juvederm, and Restylane.